Thanksgiving without pie would be like winter without snow or the Fourth of July without fireworks: the holiday just wouldn’t be complete. For anyone who follows a gluten-free diet or is new to the gluten-free lifestyle, it may seem like pie is not an option. Fortunately, that simply isn’t the case. There are plenty of delicious, gluten-free pies you can make this Thanksgiving. Five of the yummiest are described here. A warm Dutch apple pie is a staple found in many homes on Thanksgiving Day. You can make a gluten-free version that still has that same yummy crumble and mouth-watering cinnamon flavor. Substitute an all-purpose gluten-free flour in place of regular flour to top off the pie, and use a ready-made gluten-free pie crust to place the delicious apple filling in. Just seeing those words sprawled out is enough to make anyone’s mouth water. Who knew that something so decadent could be gluten-free? For the crust, use gluten-free soft and chewy chocolate chip cookies crushed up and molded to fit in the pie pan. When the crust is in place, add the creamy peanut butter and chocolate chip filling. Chill overnight and drizzle with chocolate sauce. 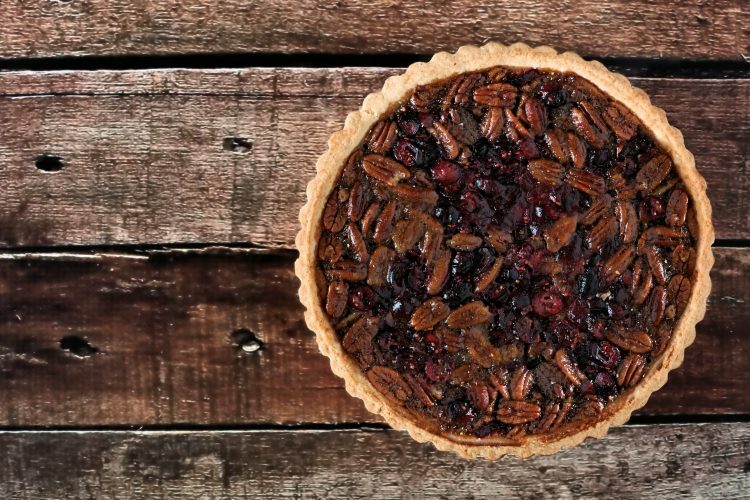 Thanksgiving would not be the same without grandma’s classic pecan pie. This year you can make the pie without the gluten, refined sugar, and corn syrup – and it will taste just as heavenly. Substitute all the ingredients you might normally use in your pie for eggs, pure maple syrup, vegan butter, organic coconut sugar, sea salt, vanilla extract, and an unbaked, flaky, gluten-free pie crust. Don’t forget to use plenty of pecans. There is something about the words “rustic” and “berry” that just make you smile on the inside. You and your whole family can enjoy this delightful pie without feeling guilty about inhaling too much sugar and carbs. Substitute traditional pie crust ingredients for a gluten-free flour blend, vegan butter, cane sugar, and non-hydrogenated shortening. For the filling, add fresh blackberries, raspberries, and blueberries mixed with lemon zest, coconut milk, cane sugar, and tapioca starch. This novel pie concept will be particularly appreciated by the kids. Instead of making one big, round pie, try making individual hand pies for everyone. The dough for these darling raspberry pockets includes a gluten-free flour blend, non-hydrogenated shortening, vegan butter, cane sugar, salt, cold water, and apple cider vinegar. The filling, simply enough, consists of fresh raspberries and organic raspberry preserves. If you would like, you can top off each of the hand pies with a bit of cane sugar and some coconut coffee creamer. Want to learn about more fun, delicious, and healthy meals and desserts that can be made for holidays or any other occasion? Check out other helpful blog posts on meal ideas by visiting iRazoo. The blog has plenty of other posts on lifestyle tips, back-to-school planning, and more.